| So, Old Dog. What Can You Teach Me Today? Fifteen years ago I stood in a dog park, surrounded by dogs, all off leash. They were sniffing me and racing around me and knocking into me. And I was gleeful, an experience which I could never have foreseen. Ever. I was laughing OUT LOUD! Having spent my entire life really AFRAID of ALL dogs, I have my daughter to bless for this joyous change. 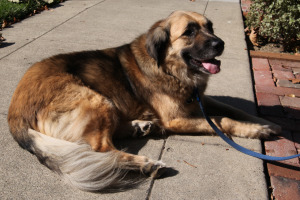 When she brought home “Smokey the Bear” I lost my fear of a dog, A BIG, 4-year old German Shepherd/Chow mix. THEN I lost my fear of ALL dogs. And then- I fell in love. I think of my transformation as if initially having lived a life without ever noticing there were babies around me-or experiencing the love they elicit. I had never LOOKED at dogs- except with an escape plan in mind. Well! I now SEE them everywhere, and rather than involuntarily putting my hands over my head to protect them, I involuntarily smile and laugh out loud! AND I am connected, thru the shared experience of love and of joy, with total strangers. Smokey lived with us for 10 years, dying at age 15 from bladder cancer. One year later we “permanently fostered” Zane, an 11 year old. Now we have Joe, (formerly “Chance”), a 10 or 11-year old Thulani dog, found on the streets of Los Angeles, brought to the shelter there and eventually flown up to San Jose to the Thulani organization. I am officially a lover of dogs. I registered with the German Shepherd Rescue having decided a FOUR or FIVE-year old dog would be just right for me, not wanting to train a puppy. I’ve raised 3 kids and never again want to repeat ‘NO”… 1 million times. I wanted a mellow, MEDIUM-sized dog. 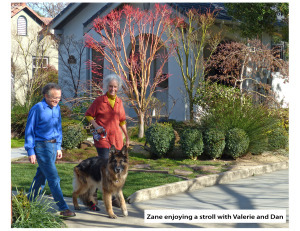 So, I searched the website and read the bios and saw Zane. He was ELEVEN and BIG. And, I was smitten. As I read the bios and looked at the pictures I was really “interviewing” each dog, and it wasn’t until I asked my husband to join me in the on-line search that I remembered- once again- how efforts to control my future cause stress and waste energy. My husband said to me: “I don’t need to look at the web site. I love dogs and I think all dogs are beautiful and any dog you choose is going to have some issue and you deal with it.” Ahhh. I knew that. Intermittently. Let the process unfold. Trust it. Yeah. Yeah. And THEN I read some MORE bios and looked at MORE pictures, and began an e-mail exchange with Ann H. Zane had already been placed, and Ann, seasoned in rescue and most wise, wrote in one of our spirited exchanges:”I’ve learned not to plan what rescue will bring into my life and surprises have always given me more than anything I would have planned for.” Ahhh. AGAIN. Let things unfold. And I DID feel much quieter. Quite lovely. Then ZANE re-appeared on the web-site! and I, –once again,– was planning! I spoke to Ann. She spoke to Bob. Ann e-mailed me and said “stay near your phone!” I DID! And MY feeling at the time is expressed through a delightful sounding Japanese phrase: “waku waku doki doki” -roughly translated into “My heart trembles in anticipation.” THAT was the feeling. And this elderly gentle giant came home with us. I was exuberant. I sent pictures to friends and relatives. We fussed over him and reassured him and opened our hearts. And he brought laughter and surprises and relationship and disruption and irritations. And he died four months later. Diagnosed on a Thursday, with a virulent cancer- which, by the way is more common in younger dogs- we helped him die the following day. ALL of our experiences in that relationship brought enrichment into our lives. “The Full Catastrophe” as Zorba says in the book “Zorba the Greek,” speaking of his own full, complex life. Zane was BIG and he was OLD. Weak in the hind-quarters he calmly accepted his classy red booties, necessary to prevent bleeding as he dragged his feet. He loved his walks. He loved any and all dogs, particularly the teeny ones, towering over them, sweetly. He loved Ann H.’s dear, sassy, rescue – Stella- and CHASING after her-my usually slow old guy-tried to seduce her. He was ELEGANT…tho a bit shaggy and always too thin. He was silent, barking only twice that we heard, when we tripped on him in a darkened thresh-hold. He “thonked” at night as he turned himself on his oversize bed. I called him “SIR” Zane if he refused to move or “come” or acknowledge me at all. I asked Zane, SERIOUSLY, at least once a day: “So. Old dog. What can you teach me today?” Once, having turned around quickly in the hallway and starting to walk I almost fell over him. The message from the old dog: “Slow down, lady. SLOOW WAAYY down. Be present.” Once, as I bent over to remove the dry clothes from the dryer, Zane stuck his very big head into the opening, blocking my access And it stayed there. For a LONG time. I was impatient and wanting to finish my task. HE would not budge. The Message: “Drop all agendas. Choose laughter… Be present.” Once as BIG ZANE squeezed after me into the small bathroom, I complained that I would appreciate SOME time without him asking for my care and my attention. My husband later asked: “Has it occurred to you that he is following you to determine if YOU need anything?” I said that indeed, it had not. What a powerful new insight..deserving serous attention from me. The message: “Watch the stories I tell myself. How do I even know they are true? Can I make up another story which brings lightness and nourishment? Can I live this moment WITHOUT any story? Be present.” I WAS STUDYING WITH A SEASONED BEING. I WAS LEARNING MORE ABOUT LIVING-WITH GRACE. I think I was also drawn to foster an older animal since I too am an older animal and we share quieter energy. I looked at THIS relationship as a source of joy and a complex opportunity to nurture and to experience aging and all which might accompany that. I am surround by friends and family of similar age with a wide range of symptoms; some with no issues; some with increased vulnerabilities and some friends with terminal illnesses. I choose to be conscious of this time in my life…to find the riches and the possibilities and the surprises. I don’t WANT to be the “new 50″…I can’t AVOID the inevitable grief accompanying intimate relationships and trying to do that, for me, means avoiding living my LIFE fully. “Loving without an agenda is the best of being human. And it fills us with a quiet joy to be this-along side the grief and stunning pain of loss.” (Emily Rapp.) To avoid these relationships with older companions means no Zane, No Joe. No friends. So. 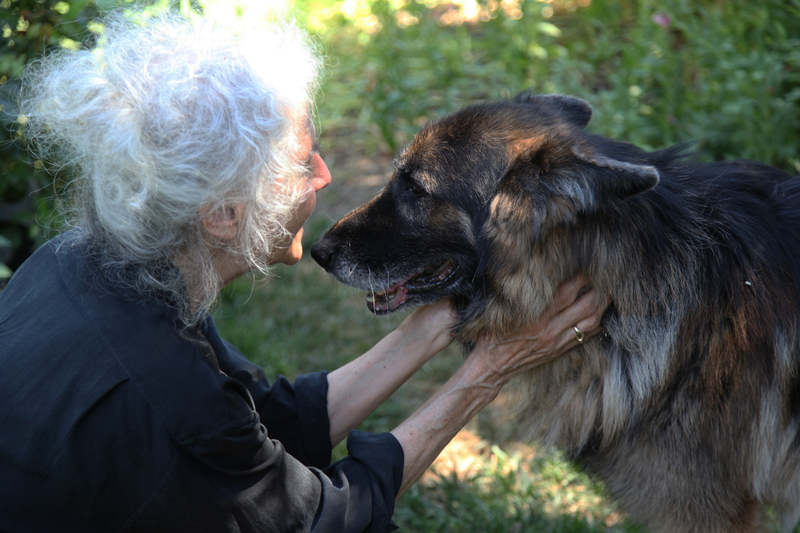 I chose an elder as a mentor-to teach me and to accompany me and really, ….JUST to be my dog. Be present. “Life and Death together. The Ultimate pairing” wrote Emily Rapp. Awe… Wonder… Mystery… Indeed, those are the feelings I had when present at human births and I consider those experiences highlights in my life. I had those SAME feelings at the death first of Smokey the Bear and one year later, of Zane. These events were also profound highlights in my life. In each passing our family agreed that our companions were just beginning to suffer and with love, agreed that their well being was our priority. There was a sense of respect for each other and for our companions – tender care. Each of us spent the morning with SMOKEY saying goodbye in our own way…a special treat…an invitation for one last walk…a pain pill… On the morning that we said good-bye to ZANE, I sat with him on the deck and simply petted him while repeating over and over again:” What a GOOD dog you are. What a GOOD dog you are. What a GOOD job you did. What a GOOD job you did.” I thanked HIM, finally, and RECEIVED the attentiveness HE had brought to our relationship…Each died in his home, out doors in the backyard- one on a muddy winter day, the other on an early spring day. Each died peacefully, gently, and surrounded with love. And standing here with you, today, I take enormous solace knowing that there are MANY of us who have given such gentle good- byes to their companions and wish that for themselves and their loved ones- who share my values in a culture which hides away its human and canine elders and pathologizes and medicalizes death and dying. Each of us will make our own way in answering these big questions. The process with Smokey and Zane helped me clarify my preferences-a significant process and powerful learning. Dogs have no made up stories in their minds, thus avoiding UNNECESSARY PAIN. Dogs do not worry that they will die in pain or alone. 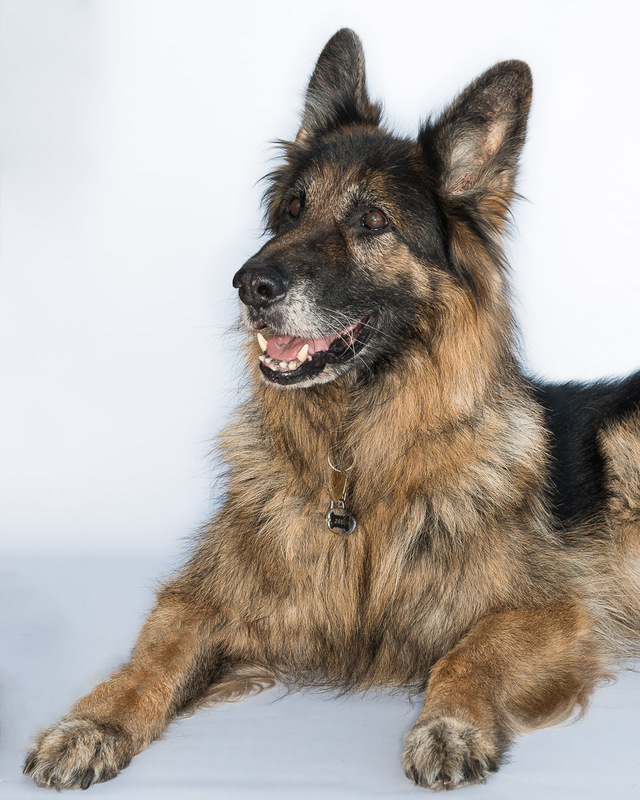 Dogs do not worry that they will become dependent or be moved to a home for the aged. Dogs do not worry about leaving their loved ones or being dead. Our dogs lay in our arms as we petted them and loved them. They were calm. The ability to nurture and provide peace and love to an animal- at any time- is one of the great JOYS of being human…human at our best and least selfish. To provide this as we help them die…to be privy to this -feels like an honor…to be a participant in this wondrous and yes, painful time– and feel the ease with which it can occur is an experience like none other. And to have had advance knowledge, as we did with Smokey, that his illness would lead to pain and death within about 6 months, helped us cherish those remaining walks and those antics and those irritations and worries. We could experience the mundane- in all its glory. That’s living fully. 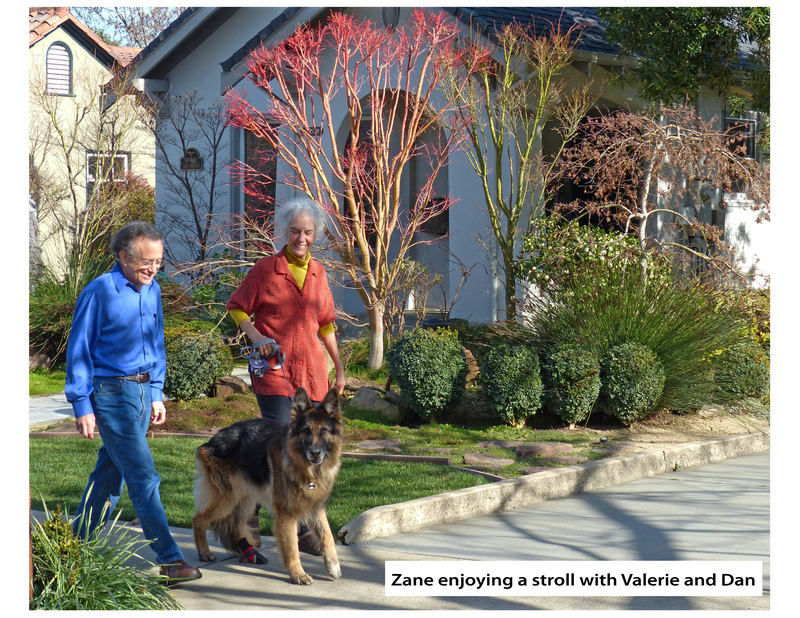 Valerie, thank you so much for writing and posting this story about your precious Smokey, Zane and Joe. Such a wise lesson to learn. I was once told by a wise friend; that the teacher will appear when the student is ready! 🙂 Isn’t that the truth! With gratitude, Kimberly Bonk – Simi Valley, CA. A simple Thank you for your wise and kind words. I needed to hear them. you have helped.